I adore food. And I enjoy creating in the kitchen. Heh, being a chef is on my list of one-of-those-careers-I-would-have-enjoyed (along with astronaut, film critic and paleontologist, heh). So, it makes sense that I really like movies about food, my top favorites being Babette’s Feast, Tortilla Soup and Eat Drink Man Woman. 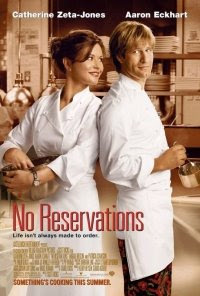 Recently, I took Don’s advice and watched another of these food-fare films, No Reservations—and while it doesn’t crack my top three, I really liked it. 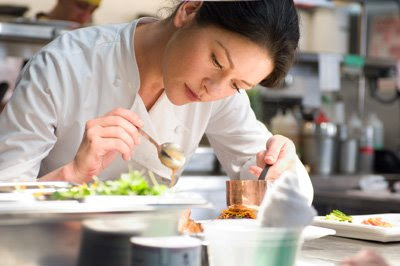 This film (a remake of the German Mostly Martha) follows Kate (Catherine Zeta-Jones), a brilliant master chef at a swanky New York restaurant who likes to be in control of her kitchen—and her life. Early on in the film, her sister and nine-year-old niece Zoe (Abigail Breslin) are in a car accident on their way to see her. Her sister is killed, but Zoe survives with minor injuries and comes to live with Kate. As Kate struggles to figure out how to connect with and be a mother to Zoe, she also must learn to relate with the restaurant’s new laid-back and fun-loving sous-chef Nick (Aaron Eckhart). Gradually, Kate finds herself experiencing life on new terms and must face some choices when it comes to determining what really matters. While the film didn't great critical reception, there were lots of things I really liked about this film. The idea that food—both its preparation and its eating—brings us together. The pain and beauty relationships entail. How love often entails doing what’s best for another rather than what’s best for oneself. And how there’s nothing like being loved and loving a child. I like this scene because it echoes a deeper and greater truth. In this messy, muddled and chaotic life, it is as we love each other that the best recipes are created—ones with bursting with the flavors like truth, forgiveness, repentance, and not seeking one’s own. This is all amplified in the Word—of which it’s not uncommon to think of as a kind of recipe book. But I think that shortchanges what the Bible contains. Indeed, it is full of unparalleled wisdom and life-changing truths by which we live, it shows us how the world really works, and it reveals who God is and how he works—but it isn’t a recipe book. No, this Word lays bear the magnificent Story of God working and loving and redeeming and restoring in the dust, blood, beauty and mess of this broken world—a Story in which we too are invited to work and walk with and grow in the likeness to Jesus. And this Story—this Word—points us not to rules or recipes or plays for life but to a relationship. And it is in that relationship that recipes are created that work best in our here-and-now as-we-go life. It is through the Story that I find out about and get to know God—and it is in walking with Jesus that I learn how to love people here-and-now in the ever complex and shifting moments of life. Indeed, there isn’t a recipe book for life. It is as we love—as we walk with Jesus, love God and love others—that the best recipes in life (and even life itself) are created.